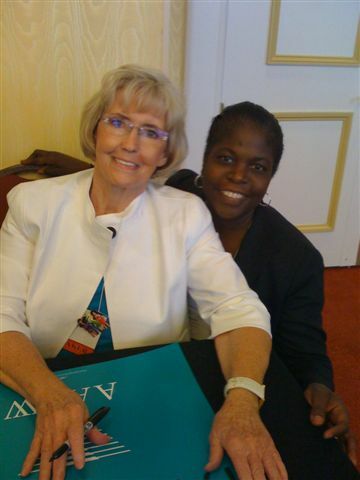 For many of us who attended the AAUW Convention, a highlight was seeing Lilly Ledbetter in person. She not only addressed the convention with her powerful story, but spent hours signing souvenirs for the convention attendees and posing for individual pictures. I know some branches are planning to use their signed posters, copies of Outlook, and more in their fundraising campaigns — but the pictures and personal memories will be important forever to those who attended. Here is Lilly with AAUW NC College/University Chair Elmira Mangum. Click the picture for a larger copy.